The Innocents Abroad, Or, the New Pilgrims' Progress: Being Some Account of the Steamship Quaker City's Pleasure Excursion to Europe and the Holy ... Adventures, As They Appeared to the Author. One of the most famous travel books ever written by an American, here is an irreverent and incisive commentary on the "New Barbarians'" encounter with the Old World. Twain's hilarious satire impales with sharp wit both the chauvinist and the cosmopolitan. About Leslie A. Fiedler (Afterword) : Leslie A. Fiedler is credited in . A published credit of Leslie A. Fiedler is Innocents Abroad (Signet Classics). 10/4/2007 Cindy Lovell said: Another best kept secret... hilarious account of the first ever "pleasure cruise" in history. Of course, with Samuel Clemens on board, what else would you expect? 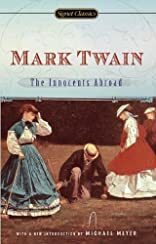 From the can-can to the Holy Land, Twain's irreverence is timeless.